Information about mountain huts in Slovenia, accommodation, prices, food and mountain huts maps. If you want to do a multi-day hike or simply enjoy a nice warm coffee and a satisfying meal on a higher altitude, you can choose from more than 180 mountain huts, shelters and bivouacs. Whilst the shelters and bivouacs have no provisions, the mountain huts cater for all the needs the hikers have, a roof over their heads, a bed, drink and great food. Huts are rarely more than four hours apart which means some fantastic high-level and multi-day routes are possible. This tiny Alpine cabin (bivouac) perches on a rocky outcrop below Skuta Mountain and can sleep up to eight mountaineers. Mountain huts are ubiquitous in Slovenia and are part of the country’s culture. They are called ‘dom’ or ‘koča’ in Slovene - a 'dom' is usually larger but otherwise there is no difference in the type of facilities available. Mountain huts are warm and comfortable. There will always be somewhere to dry your clothes and a pair of slippers to put on. Washing facilities vary! Do not expect a shower (some lowland huts do have them, but it’s rare), at best you may have a communal sink with cold water for hand/face washing and teeth cleaning. Toilet facilities are sometimes basic but usually clean. Accommodation at the huts can be in simple rooms or, more cheaply, in a dormitory. The beds are always comfortable with clean sheets and enough blankets. The extra expense for a room is rewarded by having some personal space and a good night’s sleep. Take some earplugs if you think you might be sleeping in a dormitory – it’s guaranteed that at least one person will be snoring! Bedding, including blankets, sheets and pillowcases, is provided, so there is no need to carry a sleeping bag. Huts are graded into three categories. The actual classification is a bit complicated but generally Grade 1 are the huts at high altitude, Grade 2 huts are lower and more easily accessible and Grade 3 are lowland valley huts. The lower huts usually have running water and even showers, but the higher huts have no water except rainwater. You will need to buy drinking water at high-altitude huts; make use of any springs for drinking that you find en route. We’ve gathered the prices for sleeping in mountain huts in Slovenia (year 2017). Prices for mountain huts in Slovenia. If you're planning to sleep in huts for more than just one night, we suggest you become a member of Alpine Association of Slovenia. The best way to lower the costs of accommodation is to become a member of Alpine Association of Slovenia OR its partner organizations. You can become a member even if you’re not a Slovenian citizen. You can apply online or at some petrol stations (Petrol). If you’re planning to sleep in mountain huts for more than 2 nights, we recommend becoming a member (membership entitles you to 30% to 50% off accommodation cost). A map and a list of all the mountain huts as well as hut opening times can be found on the official Alpine Association of Slovenia web page, with frequently updated information. Slovenia has more than 180 mountain huts, shelters and bivouacs. We recommend checking if the mountain huts are open before starting the trail. We also recommend booking at least 2 weeks in advance for the huts in the Julian Alps in the months of July and August, as it can get pretty busy up there, especially during weekends and on public holidays - if you've booked a campervan with us, we can help you with that! However, you will never be turned away in a bad weather (or in good), even if you have to sleep on the floor. It is worth pointing out here that wild camping is not permitted in Slovenia. Do also remember that all money transactions in mountain huts will be in cash, so take enough Euros with you! Whilst the food varies from hut to hut, typical food found in most of the Slovene mountain huts includes ‘jota‘ – a thick soup containing sauerkraut, and potato, ‘ričet‘ – a thick soup containing pearl barley and vegetables – usually these soups can be ordered with meat (sausage or other pork meat) or without (for vegetarians) and various types of sausage. For something sweet, the staple offering is usually ‘jabolčni zavitek‘ – apple strudel, ‘palačnike’ - pancakes, or ‘štruklji’ - boiled rolls of filo pastry with various fillings. Traditional homemade food is served at the alpine huts and it is delicious! This delicious comfort food will set you back around 5 - 7€ for a main dish and expect to pay around 10€ per person for a lunch with dessert or drinks. Food in Grade 2 huts is approximately 20% less. Eating your own food in the huts is allowed but you cannot cook your own food there. There is always plenty of beer, spirits and bottled water to be purchased but usually the most refreshing beverage is ‘čaj’ - a nice cup of tea. The flavour is slightly different at every hut because it is made from the petals of the wild flowers gathered at each location. Chocolate and biscuits are usually available too. Prices for food and beverage may not be cheap but when you consider how the huts have to be supplied, the prices are very reasonable. Many mountain huts in Slovenia are found in remote areas and to some of the supplies have to transported with horses and helicopters. All hikers have their personal preferences for items of clothing and equipment, but the gear really depends on the difficulty of a hike you’re taking and the number of hiking days. You should always wear comfortable clothing that is appropriate for the weather, the season and the altitude at which you are walking, plus always take an extra layer for emergencies - weather can be unpredictable up there! Happy Nest camper exploring Slovenian mountains! Know that while visiting Slovenia, seeing the Alpine part of the country is a must. It is part of our culture, it’s a place where you can disconnect from the modern-world fuzz and reconnect with the nature, it’s breathtakingly beautiful and it’s a place where adventures happen. 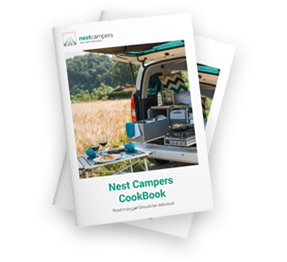 Book our Nest campervan and make that adventure dream come true!